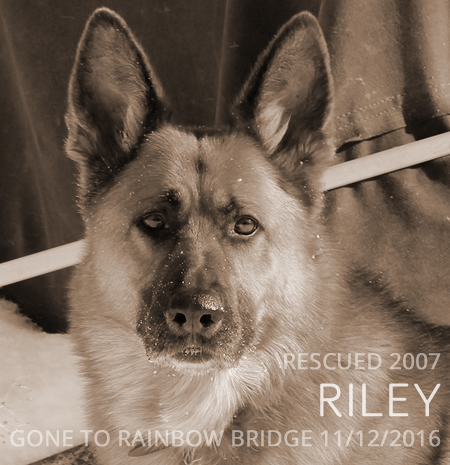 As you all know, in September our guy Riley was diagnosed with severe bi-lateral hip dysplasia meaning both hips were affected. He underwent surgery at the Spring Harbor Animal Hospital in Madison, WI for his left hip on September 19th, 2011 so he’s now just over seven weeks post-surgery. The first 4 weeks or so were very hard on him, he wasn’t doing well at all due to the pain and we were quite worried about him. He pretty much stopped eating and lost seven pounds in just four weeks. Now to a human, seven pounds isn’t a lot but when you only weigh 80 pounds a seven pound loss is not only significant but quite noticeable. Although not overweight, his surgeon Dr. Sondel suggested he lose 10 pounds because lean is better for dogs with hip problems. Although easier on us work-wise and quicker for him, starving himself was not the way we’d planned on reducing his weight. Not only did he stop eating, but he pretty much went into what I call “self-induced crate hibernation mode” meaning he preferred his crate to any place else in the house including being with his family. If you know anything about German Shepherds, you know that their family is probably their highest priority and that to remove themselves from their family’s company is way beyond weird and all the way up to very scary. To say I was worried doesn’t come close to describing my emotional state of mind. I about bent myself into the shape of a pretzel trying to get him to eat and probably drove Dr. Sondel a bit nutsy with my phone calls (sorry, Doc!). We’re talking about a dog refusing to eat raw meat! I made umpteen trips to the grocery store trying to find things he might eat and in most cases, he’d look, sniff and turn his head away. One day he ate some Campbell’s Chunky Chicken soup and I was absolutely over the top with happiness! Thinking I’d hit on the answer (everyone wants soup when they’re not feeling well, don’t they?) I bought more soup. But after the one bowl, he wouldn’t eat any more. (Note that if you feed your dog soup make absolutely sure to read the ingredients closely – do not feed any food that contains any form of onions!) Over a period of time we tried a number of different foods including eggs and KFC Grilled Chicken and their mac’n’cheese which he loves and got the same sad results. If he were feeling well there’s no way he’d turn his nose away from any of the foods I tried. I was emotionally exhausted from worry, racking my brain for what to try next and totally out of meal ideas. He was eating once every 3-4 days and his intake of water was almost non-existent. I knew he wouldn’t starve to death but that didn’t help a whole lot to ease my worry. Where would he get the strength to recover if he didn’t eat? But what scared me more was the fact that his water drinking was almost zero and so I was quite worried about dehydration. I began to visualize him hooked up to an IV fluid drip and having to spend days in the doggie hospital. When he wouldn’t come out of his crate I would serve his meals and water in his crate but this rarely made a difference. He was on two different pain pills, an antibiotic, Dasuquin with MSM for his glucosomine supplement and his thyroid meds. I knew he handled the latter two just fine but the side effects of the pain pills and antibiotics were things like nausea and liver damage. He’d always had a bit of a touchy tummy until we changed to a raw diet and all these pills were not helping his tummy. After the second week post-surgery I found some homeopathic remedies and took him off the pain pills and antibiotics and we started to see a very slight improvement in his eating and water intake. AQUA PAWS to the Rescue! I found that he wasn’t using his “bum” leg hardly at all and a successful recovery is nearly solely dependent on the use of this leg. Exercising the leg is what promotes the growth of the scar tissue that supports the hip joint area after FHO surgery. I had to find a way to get him to begin using that leg. It was suggested by people who’ve been through this kind of surgery with their dogs, that I take him to hydrotherapy. The day he had his stitches removed I made an appointment with Aqua Paws at the Canine Campus near Oconomowoc, WI. The first session (yes, the photo really is our Riley walking on the treadmill in the tank – thanks, Karen!) was just four minutes because this type of activity is extremely physical for a dog, especially one that is not actively athletic pre-surgery. Think about getting on a treadmill for the first time if you don’t exercise regularly and your physical activity is mostly taking walks. Don’t you think you’d be hurting? I know I would! His absolutely wonderful physical therapist, Karen, explained how she would work him up to a full 20 minutes over the course of a few sessions. When we left that first day, he was walking on the leg! He’s had his good days and his bad days and the hydrotherapy is not a “one time fixes all” cure. We attended two sessions a week for the past four weeks for a total of nine sessions to date and just this last week he’s begun using his leg about 98-99% of the time. I have not doubt we would not have seen this kind of progress without Karen and Aqua Paws. Not only did Karen work with him in the tank, but she gave me a number of different tips and activities to do with Riley that would help him get better. For example, she told me the first day that I was doing the required 10 minute two times per day walks incorrectly. We were walking to fast and so Riley was in tripod-mode hopping instead of walking. The answer to this was soooo simple! Slow the walk down to a crawl, literally one step at a time and pause in between each step. I down-shifted our speed and he immediately began using the leg. In my opinion the hydrotherapy and the crawl speed walking are the biggest contributors to him using his leg to the extent he is today. The emphasis needs to be on getting the dog to walk on the leg and it doesn’t matter at all how far you walk to do this. We pretty much stuck on the one side of the block we live on for the first few weeks. That way if I found he just could not do it, we weren’t far from home and I knew I could call someone to help me get home if I needed to. There was one day after we started walking up into the next block that he sat and then laid down and there was no getting him up. I called his Dad who came with my SUV, picked him up and took him home while Nissa and I went on a longer walk. The last few days he’s not so much as sat down to rest and sometimes he doesn’t even seem to have a limp! Riley has not been able to maneuver the stairs up to the bedroom since before his surgery. I was very very sad to go to bed without him for so long because I missed him and our cuddle times before I fell asleep. One day about five weeks post-surgery, I’d said my good-nights to him and then Nissa and I went upstairs. I don’t know why but for some reason saying good-night that day was especially hard for me and I shed some tears as I climbed the stairs. Several hours later and sound asleep I was awakened by a cold nose in my ear. Now, Nissa never does this so I was startled to say the least. As I opened my eyes in my sleepy fog to see what the matter was, there sat Riley next to my bed and the proud happy look on his face was as if he was saying “Hi Mom, I’m here, I made it up the stairs!” He still does not do the stairs daily, but so far it’s been three times. We don’t push him, feeling that when he feels safe he will go back to doing what he always did. Additional suggestions from those that have been in our situation were things like acupuncture and laser treatments. I’ve no experience with any of these but what kept circling my brain was that I didn’t want to just medicate the problem. Because of the hip and surgical pain, the additional stress put on the active three legs (remember his right hip has severe dysplasia as well) and the body’s adjustment to tripod-mode, a dog’s back and shoulders can get out of whack which then potentially presents new problems and additional related pain. Alleviating the pain without actually fixing its source didn’t seem like the way to go for us. I needed to first find out if there were more issues causing pain that we needed to deal with. I was not comfortable with the idea of poking him with needles or shooting him with a laser but I found myself quite comfortable with the idea of a chiropractor even though I have never been myself. This just seemed to be the direction my heart and common sense were telling me to follow. So, I went with my gut feelings and made an appointment with a doggie chiropractor at Animal Holistic Care Specialists about a mile west of Waterloo, WI to have him checked out. I quickly learned that at least for dogs, the term “Bone Crusher” is a far cry from being an accurate phrase. What I found was yet another wonderful place to help my Riley recover. We met with Dr. Dawn who not only consulted with me but gave Riley his first gentle adjustment. Dr. 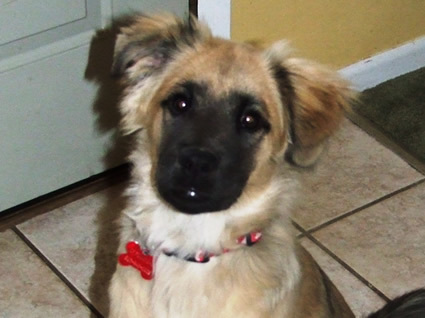 Dawn found that Riley’s issues are minimal and that he should not need weekly treatments. He’ll have another in a couple weeks and then probably once every six weeks or so until his right hip undergoes surgery which is planned for spring. We’ll then continue with chiropractic and hydrotherapy care for a few months after his second surgery. I can’t wait for the day we go to the field and he can play with Nissa again! I was amazed at how inexpensive these recovery tools are, at least around here. I did find that these same services in Madison are significantly more costly so there seems to be an association between cost and the area you live in. For example, the hydrotherapy in Madison was three times the cost of what it is in the Oconomowoc area. Go figure. I was holding my breath when I asked each place what the cost was and found myself no less than relieved when I heard their answers. If you have a dog that might benefit from eany of these services, my suggestion is to not assume it will be too costly for you to take advantage of them. Do some research, perhaps be willing to travel a bit to a less expensive (but qualified!) source of help. We aren’t rich by any means, we don’t have pet insurance and throughout all of this including the FHO surgery, these expenses have not been excessive and the end result of a pain free furkid will be money well spent! That in itself is worth a million bucks or more to us! I had a lot of help and support from Karen and my fellow German Shepherd owners for which I credit where the seeds of my research came from. Without these wonderful people, I would have been at a loss and probably made some horrible and very expensive wrong decisions for which Riley would have been the one to suffer. We thank each and every one of you for your kindness and for sharing your knowledge and experiences. Back to eating normally and moving steadily towards being himself again (minus the pain in one hip) Riley sends special thank you pupper-slobby kisses to his friends Karen at Aqua Paws, Dr. Dawn at Animal Holistic Care Services and Dr. Sondel and the staff at the Spring Harbor Animal Hospital in Madison, WI for working your magic and helping him to achieve the goal of him being pain free. I found your site while researching fho a couple months ago. There’s not much information on large dogs, even though they suffer with hip hip dysplasia as much, if not not more than little dogs do. Your blog was very interesting and full of good information. I have read it several times. My story. Our 2 year old 103 pound german shepherd had his first FHO 3 weeks ago. Like Riley he wasn’t using his leg until we took him to underwater treadmill therapy and laser. After first session he started using the leg on a very slow walk. I’m so glad we started. It helps to relieve some of the worries. I do hope that others that are having the same issues consider it as a other tool in the belt. We have followed the top dog FHO Guide that can be downloaded for free from their website. Thank you, I’m glad you found our blog interesting and helpful. Yes, big dogs do suffer more from hip dysplasia than smaller dogs. They carry around more weight and in cases of very active dogs, some of the things they do for activities such as agility are harder on their hips when it comes to turns and jumps. 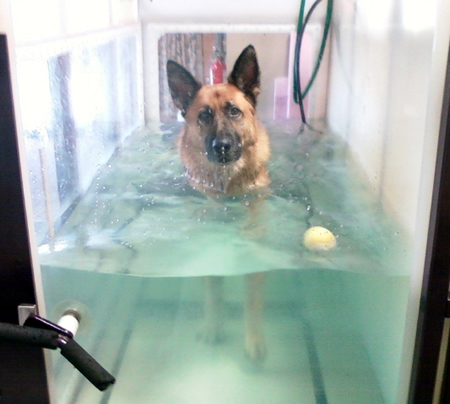 I’m so happy your dog responded well to the hydrotherapy, that’s wonderful news. It’s really a great tool just like you said! Thanks so much for dropping by and sharing your thoughts and feelings with us! I stumbled across your blog while frantically looking for solutions to help my dog. I have a 2 year old lab that was just diagnosed with DJD (degenerative joint disease). As Harley is not just my dog, but a much valued member of my family, I’ve been in tears. The diagnosis of this crippling disease in a dog so young is heartbreaking. The hydrotherapy, chiropractic care and even post-surgical recovery methods have given me hope that my baby will lead a LONG healthy life. My heart goes out to you and your Harley. 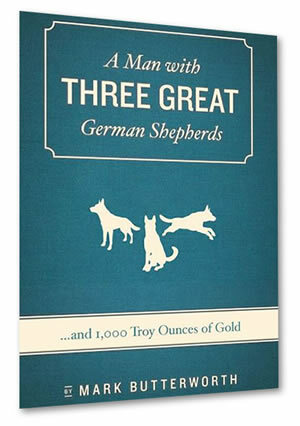 This does sound like it’s related to hip dysplasia and so the things we’ve done with Riley may very well help your dog. I have no actual experience with DJD itself per-se but it looks like there’s lots of info on it to be found by Googling. You may get lucky and find something that will really help him. Two is very very young to have such a painful disease. You might talk with your vet about adding Dasuquin with MSM to your dog’s daily medications. All our dogs get this daily, we learned of it when Riley was diagnosed with hip dysplasia and because German Sheps are prone to this we give it to all three and plan to continue to do so for their lifetime. We wish you and your lovebug Harley all the best and would love it if you’d stop back and update us occasionally.